Hi and Welcome to June’s Letter from Your Editor! Thank you for being here with us! Friends among friends! The HMN Magazine page has been updated. You can read our Summer Edition by clicking > HMN Magazine. A NEW page plus a widget have been added. The new page can be read at > Vote For Me, while the widget is placed on the right-hand navigation bar. May I count on your vote for me please? Simply use the links provided either in our new page or in our widget. Your voting for me is highly appreciated. Thank you! Daughters of Penelope in Everett are planning a dinner and dance, and hope that anyone interested, Greeks and non-Greeks, will stop by to enjoy the group’s traditional hospitality. Daughters of Penelope is a branch of the American Hellenic Educational Progressive Association, the largest and oldest American-based, Greek-heritage organization. The association has chapters around the world. It was founded July 26, 1922. It promotes the ideals of ancient Greece, which include philanthropy, education, civic responsibility, and family and individual excellence in the community. Daughters of Penelope was established November 16, 1929, as the women’s affiliate of the American Hellenic Educational Progressive Association. Although a majority of the membership is Americans of Greek descent, others may join who believe in the organization’s mission. To keep the organization in Everett alive, younger members are needed. The local chapters are hosting a dinner party at 7:30 p.m. June 23 at Holiday Inn, 3105 Pine St. in Everett. Cocktails and a social hour begin at 6:30 p.m. Tickets are $45 and can be purchased by calling 425-252-7229. At the party, there will be Greek cuisine and music. Dinner will include Psito Hirino, Greek roast pork tenderloin medallions; Manestra, a Greek pasta dish; Fosolakia, green beans Greek style; and Elliniki Salata, a Greek salad. Local chapters have taught Greek cooking around Everett. They have taught at J. Matheson, cooked a Greek Easter dinner, shared Greek traditions and participated in multicultural fairs. The June 23 Greek Night Party is in conjunction with a Daughters of Penelope District Convention with folks coming from Oregon, Eastern Washington and Canada. A Greek band is coming from Seattle, so men, don’t hesitate to folk dance together. It’s a perfect time to celebrate a unique culture. Greek dinner, dance > Daughters of Penelope in Everett are planning a Greek dinner and dance at 7:30 p.m. June 23 at Holiday Inn, 3105 Pine St. in Everett. Cocktails and a social hour begin at 6:30 p.m. Tickets are $45 and can be purchased by calling 425-252-7229. 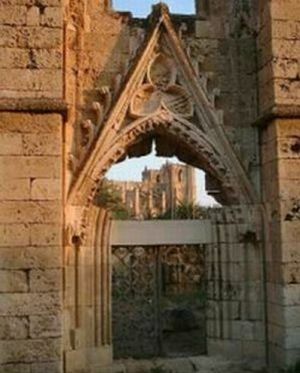 Occupied Famagusta, Ammochostos in Greek, Cyprus > An ancient Cypriot port city which inspired Shakespearean tragedy and was famed in medieval times for its architecture and wealth is on the brink of ruin because of neglect, conservationists warn. In its Venetian heyday Famagusta was one of the richest cities in the region, and a seat for the crowning of Lusignan Kings of Jerusalem. Fictionally, it marks the spot where Shakespeare’s Othello, blinded by jealousy, smothered his beloved Desdemona, then took his own life. Thick fortifications encasing the city protect a community of some 300 churches, and a stunning 14th century gothic cathedral which some art historians compare to Notre Dame of Rheims, but in miniature. In a biannual review of world heritage sites, the privately run World Monuments Foundation (WMF) has listed the city as one of 100 world sites most at risk from conflict, alongside such world landmarks as the Church of Nativity in Bethlehem, and what has been left of the Buddha statues at Bamiyan in Afghanistan. Those campaigning for the protection of the city hope the status will galvanise much-needed conservation. “It will act as a conduit through which specialised scholarship and expertise can be channelled in an attempt to protect, preserve and plan for the future of the historic town,” said professor Michael Walsh, one of two academics instrumental in drawing WMF’s attention to the walled city. But, borrowing a line from Othello, occupied north Cyprus is neither here nor there. Shunned by the international community, this small enclave with no direct links with the outside world is unrecognised by all but Turkey, which props up the Turkish Cypriot community economically. Every part of Cyprus bears testament to the cultures which have touched it over the centuries, from the Greeks to the Romans, and in more modern times, the Venetians, the Ottomans and the British. Modern Cyprus’s priceless monuments have been caught in the crossfire of bitter ethnic division between Greek and Turkish Cypriots, separated in a Turkish military invasion in 1974 resulting the occupation of the northern area of the Republic of Cyprus. The internationally recognised Greek Cypriot government does not have access to the occupied and Turkish military controlled north area of the Republic, and generally frowns on any intervention in antiquities which is not officially sanctioned by them. Underscoring sensitivities, the head of the government’s Antiquities Department was quoted as saying Famagusta’s appearance in the WMF list was “adverse”. “The Antiquities Department and the Foreign Ministry are working together to find the best solution,” Department Director Pavlos Flourentzos told the Cyprus Weekly newspaper. The gothic citadel of St. Nicholas Cathedral, which today, after the occupying illegal regime changed its name to Lala Mustafa Pasha Mosque and converted into a mosque, bears testament to the neglect. “No serious work has been done there since the British times. Stones are falling from it and damp is rising up from the sea damaging it from below,” Turkish Cypriot archaeologist Muge Sevketoglu told Reuters. “The citadel is like an aged person who is in need of constant care.” Archaeologists say the political situation prevents proper conservation work on artefacts. Under the Hague Convention, archaeologists working in occupied northern Cyprus are breaking the law, as they are working without the consent of the internationally recognised Cyprus government. “That has traditionally meant the archaeologists who work here will no longer be able to work in Greece or south Cyprus,” said Sevketoglu, referring to the territory under Greek Cypriot control. Which does not solve the problem of occupied Famagusta. “Many of the buildings are in danger and need architects to come and work and make them structurally sound,” said Allan Langdale, who worked alongside Walsh in filing the application to the WMF. But whether it will manifest itself in better preservation remains unclear. “It is one thing for the WMF to recognise the need for protection and restoration. Its another for it to defy the embargo and provide funds,” Langdale said. Posted by grhomeboy in Hellenic Light Africa, Religion & Faith. Greek Deputy Foreign Minister, in charge of matters involving Hellenes abroad, Theodore Kassimis, departed for Egypt today for a three-day visit. During that time, he will meet with the Patriarch of Alexandria and All Africa, Theodore II and the President of the Council for Hellenes Abroad, Stephanos Tamvakis. He will also have contacts with the Greek community and Greek-Egyptian organisations in Alexandria. On Sunday, June 17, Mr. Kassimis will officially inaugurate the Patriarchal School, “Megas Athanasios” together with Greek Education Minister Marietta Yannakou. Meanwhile, CHA assists the work of Alexandria Patriarchate. The President of the Council for Hellenes Abroad, Stephanos Tamvakis, has assured the Alexandria Patriarchate of the CHA’s constant support for its work. He was speaking at the official welcoming ceremony for the Church of Greece delegation which arrived in Egypt for the opening of the Saint Nicholas cathedral in Cairo. Posted by grhomeboy in Environment, Religion & Faith. The former US Vice-president Al Gore on Tuesday visited His All Holiness Ecumenical Patriarch Bartholomew in Fanar. Mr. Gore is in Turkey to attend a press conference for the “Live Earth” concerts to take place all over the world in order to raise public awareness about the phenomenon of global warming. The former American VP said he was proud to meet with the Patriarch, who, he said, is well known worldwide as the “Green Patriarch” because of his concerns about the environment. He added that the Patriarch’s presence in Constantinople was a “great honour” for Turkey. An international conference, entitled “Post-Civil War: Austria, Spain and Greece compared” is being held today in Austria, with the participation of well known experts from Greece, Austria, Germany, Spain and the United States, who will refer to the various repercussions of the civil wars in Greece, Spain and Austria up to the present time. The keynote speaker on the topic of the civil war in Greece is Professor Nikos Marantzidis from the Thessaloniki-based Macedonia University. A nascent international initiative to restore the Hagia Sophia Cathedral in Istanbul as a place of worship for all the world’s Christians was outlined on Thursday by a veteran Greek-American political leader, less than a week before a public hearing is scheduled on the religious monument’s condition at the US Congress. Chris Spirou, a noted New Hampshire Democratic leader and Greek-American political leader, said the organisation he heads up, Free Agia Sophia Council of America, will present evidence showing the “violation” of Eastern Orthodoxy’s most renowned basilica over the past 554 years. “We will demonstrate that the violations have turned this most sacred site for Christians into an international bazaar. We will present our belief, as a Council that believes in human rights, that no government has the right to determine the use of a church or has the right to appoint or approve of religious faiths, to ordain priests or to determine holy figures,” Spirou charged in a clear reference to the Turkish government. He nevertheless stressed, at the beginning of his comments during a press conference in Athens, that the initiative has absolutely nothing to do with Greece or sensitive Greek-Turkish relations and US-Turkish relations, or even Greek-US-Turkish relations. He also said he has had no contacts with Greek officials or the Ecumenical Patriarchate over the campaign, noting that he learned of his invitation to appear before the joint Congressional Human Rights Caucus while on a visit to Athens. “The Ecumenical Patriarch is in the same position as the Hagia Sophia. He, the Patriarch, is in captivity … I don’t want to worsen his position,” Spirou said in answer to a press question. Moreover, he emphasised that the Hagia Sofia is to Orthodox Christians what St. Peter’s Basilica in Rome is to Roman Catholics, or the Wailing Wall to Jews and Mecca to Muslims. The Congressional Human Rights Caucus will convene next Wednesday to focus on reports of violations, brought up by the Council, at the Hagia Sophia in Istanbul, the renowned early Byzantine-era cathedral that was converted into a mosque after Constantinople’s fall in 1453 and later turned into a museum in the early 20th century with the establishment of the Republic of Turkey. The hearing, held by the joint Congressional Human Rights Caucus (CHRC), marks the first time that Congress will hear testimony on the situation concerning Hagia Sophia. The hearing will be chaired by Congressman Tom Lantos (D-Ca), the chairman of the influential House Committee on Foreign Affairs, with Spirou representing the Free Agia Sophia Council of America group during his testimony before the caucus.